Vancouver Pen Club: June & Bart's Japanese Pen Store Adventures! June & Bart's Japanese Pen Store Adventures! 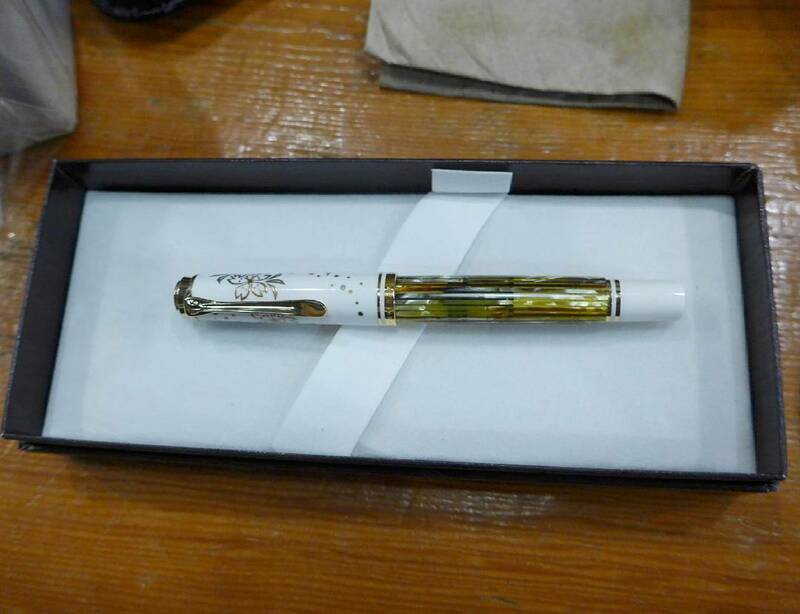 In which we, once again, live vicariously through June & Bart's pen-related trips (see their 2017 Los Angeles pen show report here) ... this time to two Itoya stores in Tokyo and Tokyo's Bungubox store! The entire set of photos from these trips can be accessed by clicking this link ---double-click on individual photos to open files, and then hit the "+" button to see the image close-ups. "Regular" Pelikans (ha) for sale, too! That is the actual president of Bungubox! President Kaoru Yamagishi served us some nice cold tea, chocolate, and sparkling wine to support Premium Friday! Very cool. Premium Friday we learned is this odd sort of government initiative to encourage people at work to leave work early on Friday to shop and support the economy. Stores all around will have little special promos on the last Friday of the month called Premium Friday. A photo of June's Pelikan taken with my (Maja's) camera in September (click on image to enlarge) . The pen has a delicate, hand-painted sakura (cherry blossom) design on it, done in gold lacquer (maki-e)--- a rare and lovely writing instrument! Wow, what a great trip! Many thanks to Bart & June for the great photos and report!! Once again, all the photos from Bart & June's Japanese pen store visits can be found at this link .